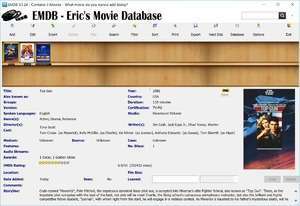 EMDB (which stands for Eric's Movie Database), a complete cataloging and management application with which you can conveniently manage your movie collection, whether they be on VHS/DVD/Blu-Ray. It really doesn't matter what format they are in or even if they are DivX or XviD files, you can easily manage and catalog them while fetching data and cover art from online sources. EMDB has support for multiple formats, and is further connected to the IMDB, the largest movie database Internet. It will automatically fill the data in from each of your movies. Version 3.41 is a freeware program which does not have restrictions and it's free so it doesn't cost anything. For security reasons, you should also check out the EMDB download at LO4D.com which includes virus and malware tests. Additional screenshots of this application download may be available, too. Featuring the very best in free cataloger downloads. Editing staff adds reviews and free download links and constantly updates software. Check out some of the freeware downloads available in the cataloger category. They contain no strings and are available at zero cost. 4.5 out of 5 based on 15 ratings.